Matthew was a PHE-NO-ME-NAL tour guide. He got us everywhere we wanted to go as smooth as possible given the huge crowds and was very nice and polite. His English is also great and is very easy going. I highly recommend him as a tour guide. I would say that there is a lot of hiking on this tour though and does not include the glass bridge which locals say is overrated. Still, a really great guide goes a long way to enjoying all this park has to offer....and you do need a guide to get around the buses that transport you around the park!! 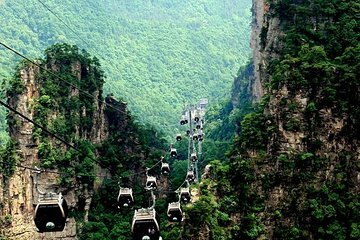 The perfect way to see all Zhangjiajie highlights! We loved Eric, he was very friendly and full of knowledge and stories. Transportation was easy to/from the airport to our hotel and the drivers were all very good. The company is very responsive when contacting with your hotel itinerary. Just don't use Google! Gmail doesn't work while in China. The national park is absolutely gorgeous. There are plenty of places along the tour for water/snacks from locals. The first day was more walking/steps as you are up in the mountains. The second day with the path stream was very peaceful. Dress in layers too! Lunch was had at a local restaurant and our guide ordered based on our taste we love trying new foods. Hunan food is delicious and the wheat tea was a highlight brought some home!. This tour company is very organized and very professional. Highly recommend! We could not have been happier with our Zhangjaijei experience. Our guide / interpreter Mathew was superior, and worked out our schedule to visit Tienmen mountain when the skies were clear and we were able to see all of the natural beauty. The sites were breathtaking and we would not have been able to navigate to and from the multiple spots on our own. If we had not had our excellent guide we would only have been able to see a small portion of the sites. HAVING OUR OWN PERSONAL GUIDE MADE THE TRIP 100 BETTER. Thank you Mathew and Viator for this once in a lifetime beautiful experience! Rain or shine, Zhangjiajie offers spectacular scenery unmatched anywhere in the world! A bit of rain and clouds moving through the sandstone mountains on Tianzi Mountain brought the perfect bit of mystery to this mystical place. If you're an Avatar fan you'll feel like you stepped into the movie with a Chinese flare. My guide, appropriately names Joy was a true Joy to spend my time with exploring some of the most beautiful scenery on the planet!